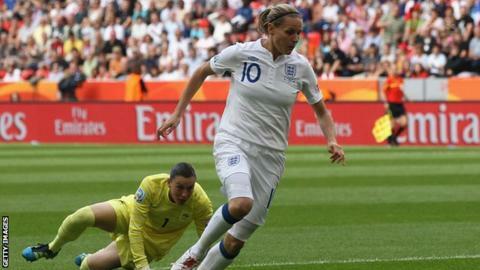 England forward Kelly Smith says she is thinking about retiring from international football after next summer's European Championship. The 33-year-old Arsenal player has already helped Hope Powell's side qualify for Euro 2013 in Sweden. But Smith, who has withdrawn from the squad to face France on Saturday in Paris, said making the 2015 World Cup in Canada may not be a realistic aim. "My next major tournament and last one is probably going to be at the Euros." She told BBC Sport: "I'm hoping to be fit and ready and hopefully my body will allow me to get there. "I will assess how I feel if selected for the Euros and, if I play there, whether I have it in me to go another campaign." Smith, who has had an injury-hit season for the Gunners and only just recovered in time from a broken leg for the Olympics, added: "There's not another World Cup for another two years, so [Euro 2013] could possibly be my last international tournament. The plan is to go there and win it." England reached the final of the 2009 European Championship but were overrun in the second half by Germany, eventually losing 6-2. They kick off their preparations for Euro 2013 on Saturday against the team they lost to on penalties in the last eight of the 2011 World Cup. Smith, who is England's record goalscorer with 45 goals from 111 games, had been named in the squad but suffered a thigh injury after the Olympics and missed the win over Croatia which booked their passage to Sweden. "I'm still feel like I've got a good couple of years left in me," she said. "I still feel like I could play in the Women's Super League even if I wasn't playing internationally, so I'll continue playing for Arsenal after I've stopped for England. "Coaching is on my mind, coming into the latter part of my career, and I'm trying to be more observant during Arsenal's training sessions."